I started taking lessons with Suzanne after having an unhelpful time with a “Pass in 5 Days” course with another company last year. I had already passed my theory but it had been a long time since I had done any driving. 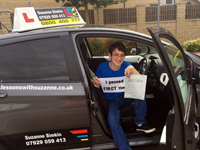 Suzanne has a patient and organised personality which I found very helpful and calming as I was learning to drive! 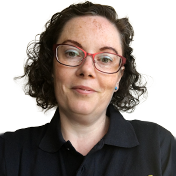 At the start of each lesson, she will go over what happened during the last session and cover any points that need discussing/ Then she will ask you what YOU want to do during this lesson, whilst giving you pointers and guidance. This means that you will always be doing something that you feel you need to be doing and that you want to be doing that day, rather than being told what to do each lesson. During the lesson, you will usually be talked through exactly what you need to do and look out for whilst at the side of the road, allowing you to be clear about the process or the manoeuvre before you even attempt it. You will then go ahead and complete the manoeuvre, pull over again and review afterwards. This instant feedback whilst it is still fresh in both minds is very useful for improvement! This also means that during the driving, you can focus on the road and the test ahead, instead of having to split attention between the road and listening to instructions. I always felt very at ease when asking Suzanne questions, and was encouraged to do so which allowed me a much quicker understanding of a lot of key concepts. When you first have lessons with Suzanne, she will provide you with a login for LDC's online systems and an LDC workbook. These are high-quality resources, and the workbook especially goes into depth about the exact criteria the examiners are looking for in each test category and gives the exact wording to all the “show me tell me” questions, which I found incredibly useful! The LDC Student Hub will have a record of every lesson you have with Suzanne, and also has a lot of useful videos about driving. A lot of these can also be found on YouTube too, which will give you an idea of the quality of LDC materials. I would thoroughly recommend Suzanne to anyone, her calm approach and student-focused style is a multitude better than my previous instructor's style of bombarding me with too much information by yelling stuff whilst I was in the middle of a roundabout! Her honest and accurate feedback at the end of every lesson lets you see and measure your progress, and see how close you are to becoming ready for the test. Her punctuality is great, arriving 5 minutes ahead of every lesson. Her car is clean and comfortable to drive. Thank you, Suzanne, for getting me my driving licence! Five stars from me! I'm a driving instructor in Tingley, East Ardsley, Morley, Middleton, Wrenthorpe, Ossett, Batley, Thorpe, Lofthouse, Robin Hood, Gildersome, Churwell, Belle Isle and surrounding areas.